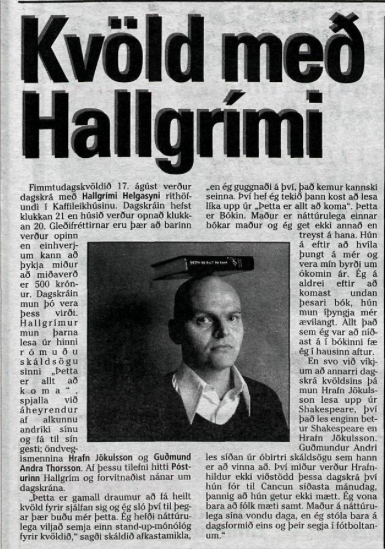 In August 1995 Helgason was asked to program a cabaret night at the Café Theatre in Reykjavik. He decided to read from his latest novel and get some friends to do the same. But for the last 30 minutes of the program he decided to experiment with stand-up comedy. Helgason had been living in New York during the eighties where stand-up was in vogue, but in Iceland this phenomenon did not exist. However, this part of the program proved to be the biggest success, so when asked to do another cabaret night, Helgason decided to prolong his routine. After a few more sold out nights, the program had evolved into a 2 hour long stand-up routine, with a break in the middle. It ran for two months and Helgason even toured the countryside with it. But after some drunkards started heckling him on stage in the east part of Iceland, Helgason decided that the entertainment industry was not for him, and took his stand-up comedy to sit-down writing.